Its no secret, I’m a cheesecake fanatic. Just check out my Cheesecake Ice Cream & Healthy Cheesecake dip! So it’s no surprise that I’ve added a little cheesecake to my fudge recipe. 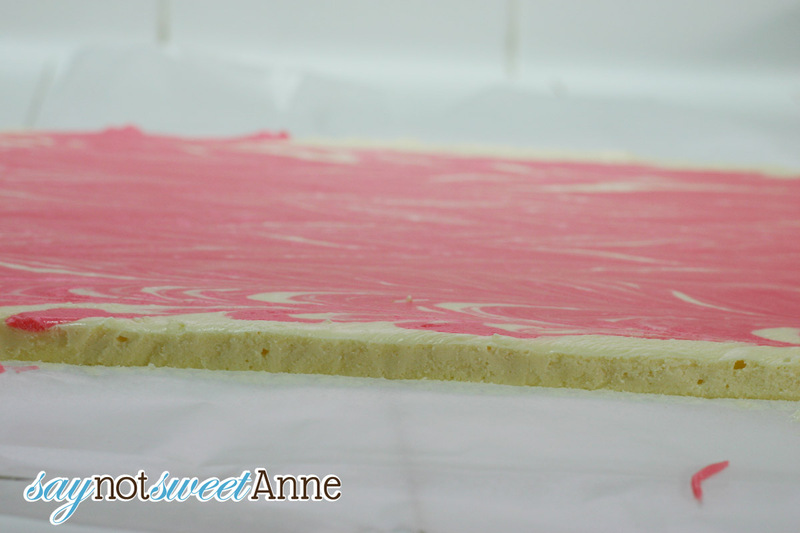 Introducing Strawberry Cheesecake Fudge! Oh and did I mention its easy? How about that it’s pretty? Or should I just focus on the fact that its DELICIOUS!? I brought a plate of 3 fudges to a family gathering, and this one was gone before any of the others. 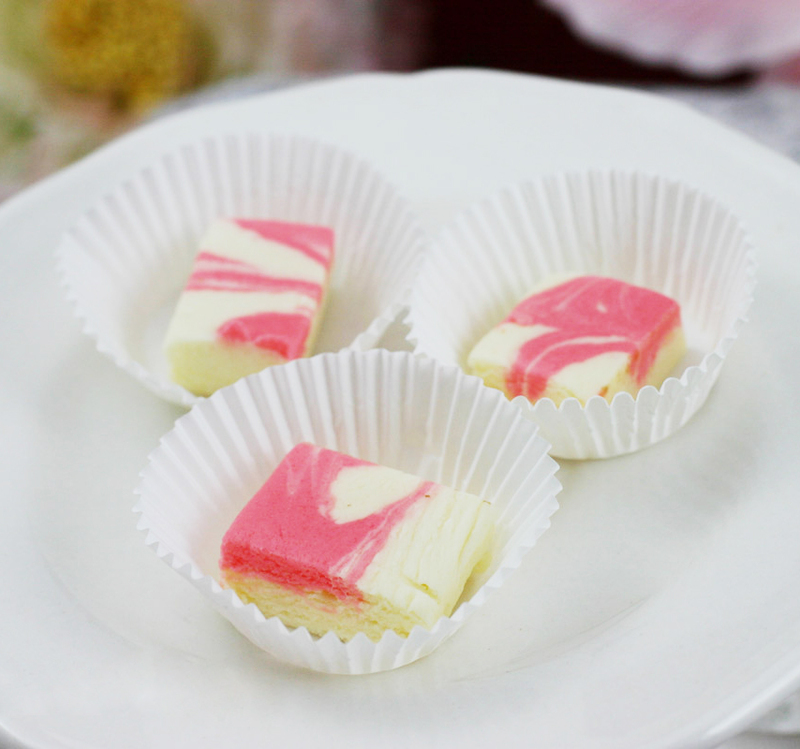 These little bites of Strawberry Cheesecake Fudge are so perfect for a Valentine’s Day treat, or a bachelorette party – even a baby shower! Prep a 9×9 or a 9×13 inch dish with wax paper. 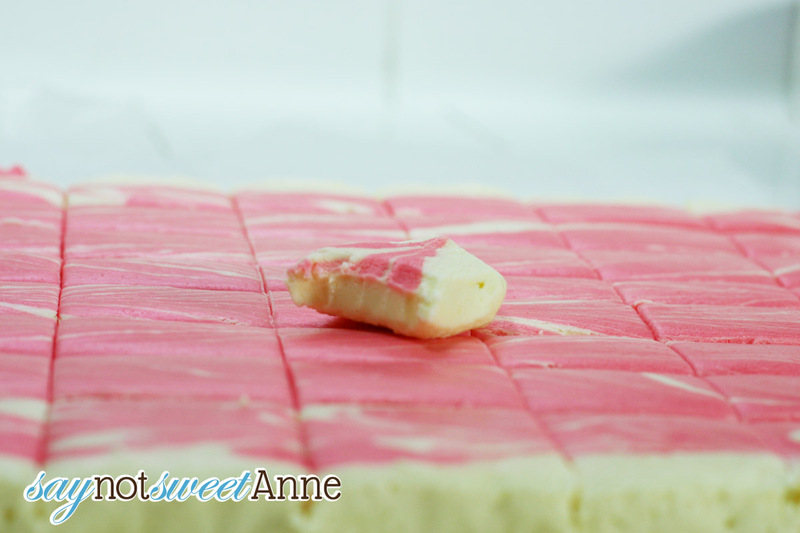 This will help you remove the block of fudge and cut it nicely. 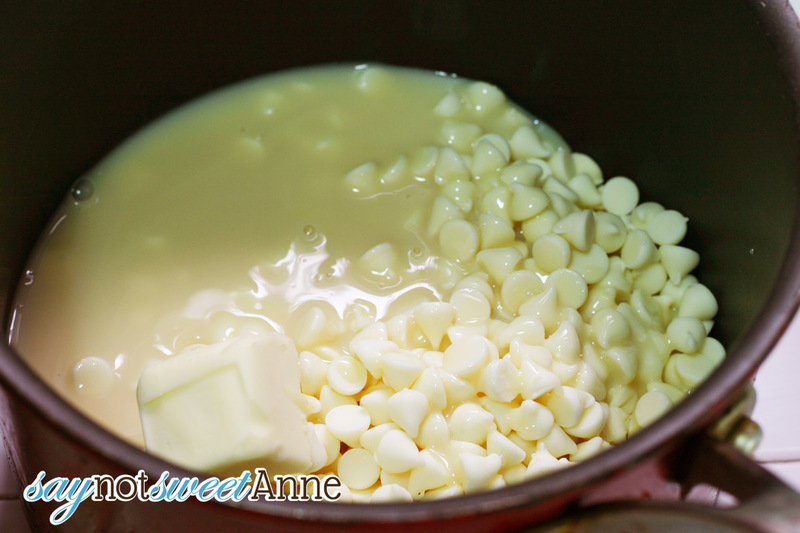 Mix the chocolate chips & butter with the sweetened condensed milk and melt over medium heat in a saucepan. Once smooth, add in the cheesecake mix and stir until combined. It’ll look grainy at first, but keep stirring for a minute or two. 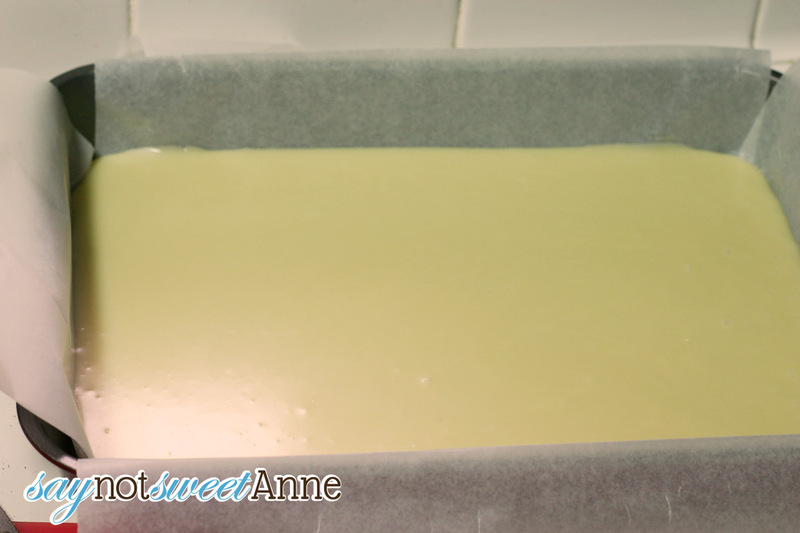 Add in the mallow cream and stir until mixture is smooth and creamy. Pour 2/3 of the mixture into your pan. Add 1-3 tbs of the strawberry gelatin mix as well as 1/4 cup warmed heavy cream into the remaining mixture. Stir until even in color. 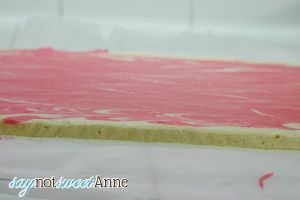 Pour the remaining mixture into the pan, use a toothpick to swirl the two together. Refrigerate until set, remove from pan and cut! That’s it!! What a fun fudge flavor! I love using pudding mixes to create fun flavors too! 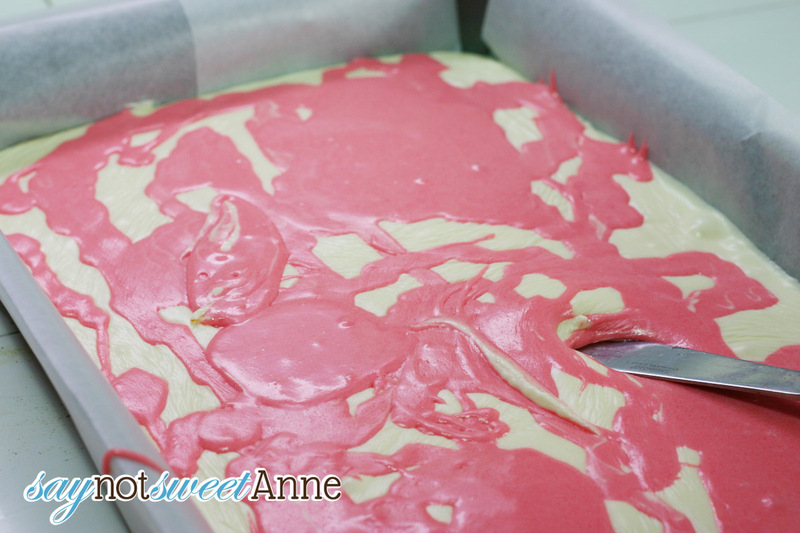 This one is so pretty with the strawberry swirls in it!!! MMMMMM this looks sinfully delish! I am asking what kind of mallow cream. Fluff or just reg. marshmallow cream. 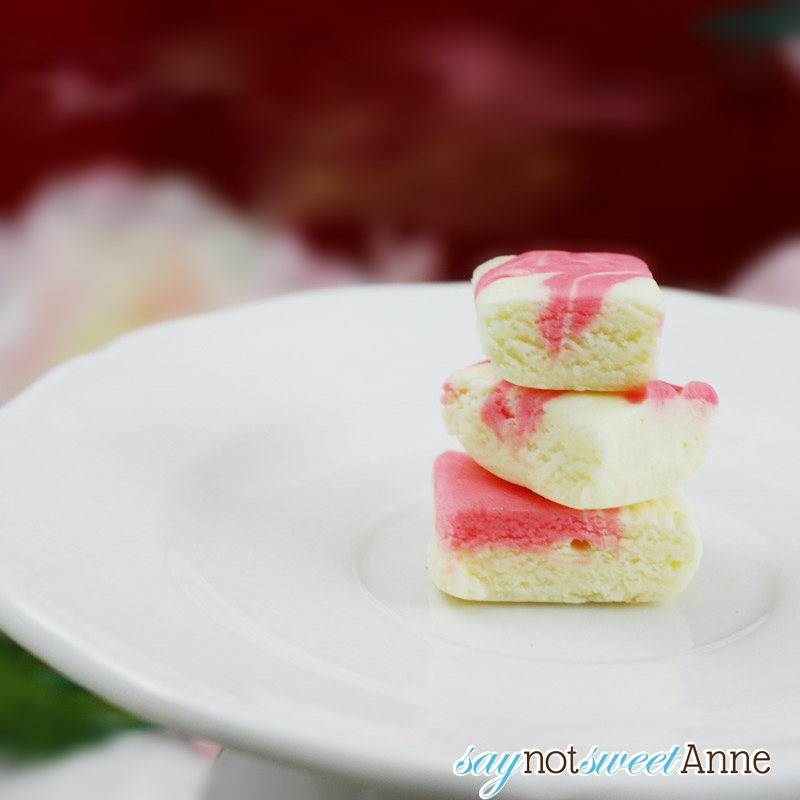 I have found fluff to be like a taffy consistency so i just wanted to know which one you used for this recipe. Thank you. I used fluff because that’s what I had on hand. In my understanding, the two are the same, except for the way they are “whipped”. I do notice that there is a texture difference though! Hey I love your recipes and I was wondering, for the strawberry cheesecake fudge recipe can I use cream cheese instead of jello cheesecake pie filling? I’m glad you like them! I really don’t think so. Cream cheese isn’t safe at room temp, and it adds liquid to the mixture. 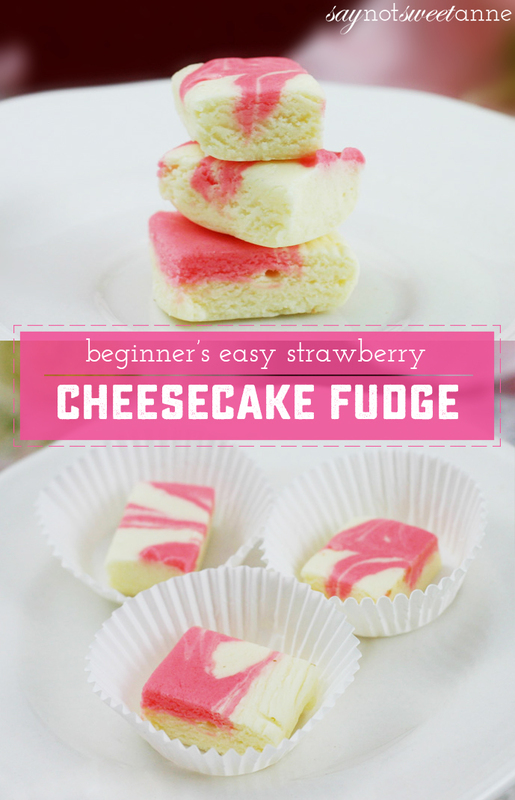 There are other cheesecake fudge recipes out there that use cream cheese. Maybe see how they do it? When you say: Add 1-3 tbs of the strawberry gelatin mix into the remaining mixture. Stir until even in color. Are you talking about just the powder or do you make the gelatin? When you say stir in the cheesecake mix am I suppose to make the mix or just use the powder? I think all Jello No-bake cheesecakes are instant. In that they don’t require any heat. This recipe sounds great! I have some friends; however, who are not fans of white chocolate. Have you ever tried this recipe with regular chocolate? What do you recommend: milk, semi-sweet, or sweet? Thank you! Hey Gi! I really wouldn’t recommend trying this with regular chocolate. The cheesecake flavor would certainly be lost entirely. That said, the white chocolate (which is actually just cocoa butter and vanilla) does not come through in the flavor. It is used more as a solidifying agent in the fudge, to keep us from having to boil sugar. I highly suggest you try it, and just don’t tell anyone there is white chocolate inside. They’ll never know! OK, will do! Thank you very much! Thanks for sharing such a delicious recipe! My family is loving trying out fudge recipes these days, and like you said, cheesecake + fudge = amazing! I hope they love this one too! I’m sorry – I’m not sure I understand the whole question. I would classify any fudge as a candy, is it not like that where you are from? I get a lot of my fudge ideas from the vendors at Mackinac Island here in Michigan, they are famous for fudge!! When you say to make it more like fudge, do you mean the texture is off? As for making it less sweet… maybe swap out the sweetened condensed milk for regular heavy cream? This should cut down on the sugar content and might give the flavor your looking for. If that doesn’t work, maybe just strawberry cheesecake? You know I love cheesecake! I have tried this twice and it comes out grainy, what am I doing wrong? Oh no! I’m sorry to hear that! 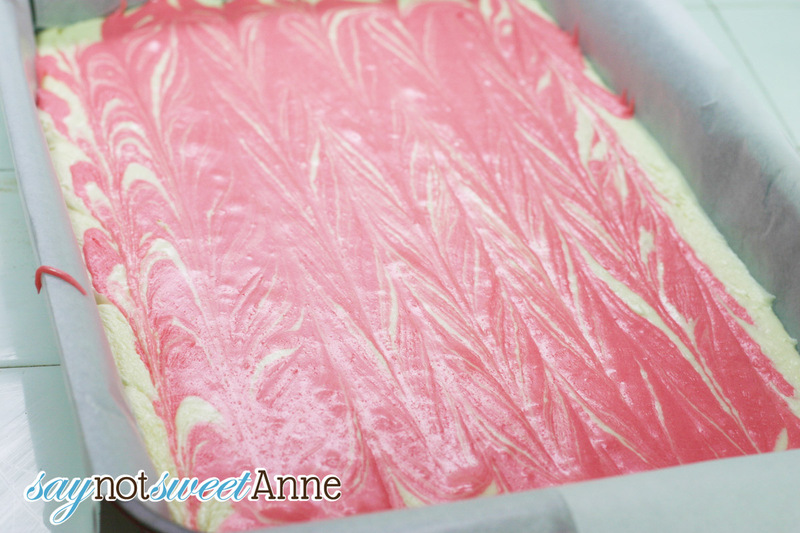 Can you tell if it is the strawberry swirl or the base cheesecake that is grainy? I would try dissolving the base cheesecake in 1/2 cup of heavy cream before adding it into the chocolate and condensed milk mixture, and see if that helps! Made this but it was like sugar didn’t dissolve. When adding the gelatin to 1/3 should you keep heating the fudge thru the whole time of recipe, keep it on the heating element till thru? Hello Ann! I’m sorry this didn’t work for you the first try! I don’t usually keep heating the 1/3 while adding the strawberry, because I’ve never needed to. However, if you’re having a problem with the strawberry swirl being grainy, I recommend dissolving the 3tbs of strawberry gelatin in about 1/2 cup heated cream or milk before adding it into the 1/3 reserved mixture. That way you can make sure it is nice and dissolved! Well, don’t leave us hanging Patricia! How was it? If I mixed the strawberry gelatin completely with the cheesecake mixture do you think it would still give it a good flavor? I want to dip this in milk chocolate. Like a truffle. Wonda – YES. That sounds AMAZING!! Thank You Kayla, I’m going to try it. You may have answered this question, and I am still not understanding. On the cheesecake mix. Do you mix the cheesecake as directed on the package or just use the powder ? Hey Wonda – You just use the package mix. Hope that helps! Hi Teresa! You don’t need to cook it at all! You only melt the chocolate and condensed milk on the stove until smooth. Hope that helps!